In the beginning I learned German to survive. The helplessness of being in the hospital after the birth of my first son was a catapult to make me learn quickly. 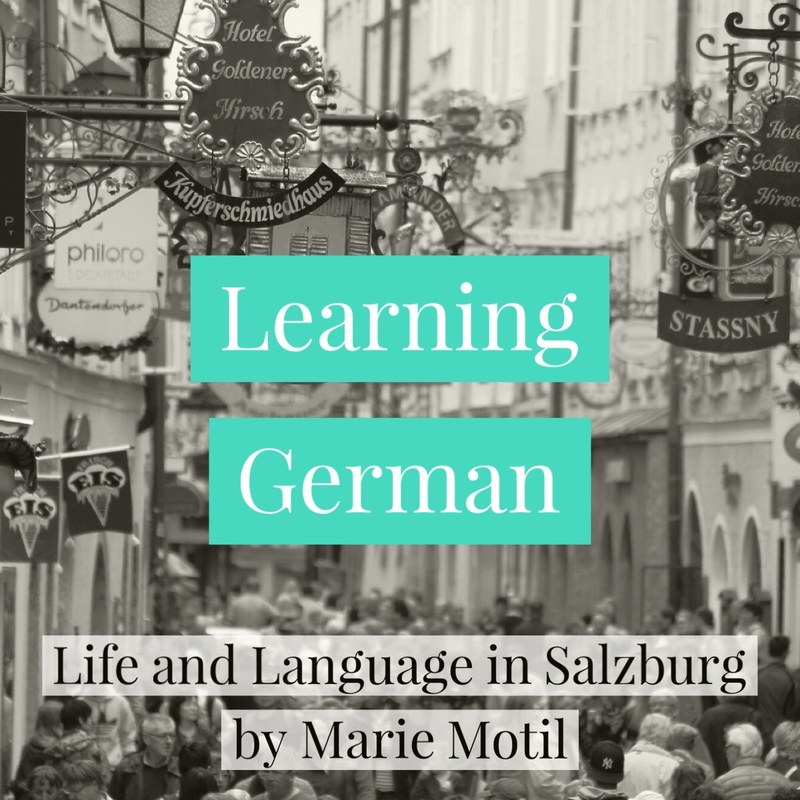 I had already lived a couple years in Austria but worked in an English speaking environment and spoke English with my Austrian husband at home. But just hours after birth, I was slowly walking along the hospital corridor practicing how I would ask the nurses to please replenish the toilet paper in my room. What’s replenish in German? How should I formulate the question? I had just recently been told at a business English course filled with older, Austrian businessmen that in the sauna, when everyone’s naked, it’s better to use the informal du as opposed to the formal Sie because in the sauna, everyone is naked and equal. Does the same apply when speaking of toilet paper? I was ashamed of my limited German skills at the time so I really wanted to impress them with a proper, polite, grammatically correct sentence. I approached the nurses station, lightly knocked on the door jam and cleared my throat. But what came out was more like this: “Good evening, would you be nice? You take for us participants in room 104 toilet paper? We are urgently needing now.” At least that’s what it must have sounded like to them because after a short pause and to my shame and embarrassment, they burst out laughing. They left the nurses station choking back laughter to get my much needed toilet paper leaving me even more ashamed by saying “Das war soooo lieb”. So cute? Me? A confident, six foot tall ex-volleyball player? Hell no. The word cute never resonated with me as it was reserved for tiny, little girls in grade school and not for tall, sporty girls like me with my lanky, legs sticking out from my catholic school uniform. I was always with the boys at the back of the line because I was second tallest in my class. Forever placed in the back row for school pictures. Nothing cute about that. So, I squared my shoulders and trudged back to my hospital room as confidently and un-cute one possibly can just hours after giving birth. 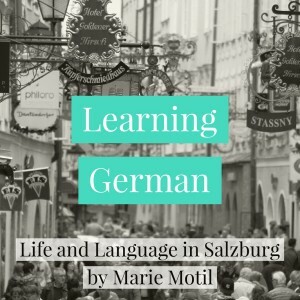 I was determined to learn German better and suit my language skills to the personality I wanted to have in German. That was a major turning point that had me practicing my awful German on salespeople, in restaurants and on Japanese tourists who stopped me on the street for directions. I never let on that I was an American just so I could practice giving directions in German. There was a noticeable increase in Japanese tourists lost and roaming the streets of Salzburg in those years, for sure. I was growing quite confident in my language skills but then I met the local butcher and the meat ladies. The meat ladies were knife-wielding, meat-swinging, robust women who vigorously handled meat.I bought packaged meats for ages just to avoid the glare and gruffness of the local butcher and his meat throwing assistants. I wasn’t alone in my fear of them, either. Many a foreign friend of mine also skirted around the meat counters for fear that one of the meat ladies would speak to us. The problem was the dialect. Is it necessary in Austria to have a wild dialect when you work in meat? Everywhere we went it was the same, even in Salzburg city where every store owner, every vendor can speak at least some level of tourist English, but you could always count on a blank stare from the meat ladies, a pause, a quivering of chin whiskers. The procedure was the same for all of us, we’d cower, put on a lame grin and point mutely to the chunk of meat or cut of sausage and pray they understood when you told them how much. We were all cowards when faced with the meat ladies and often went home with an abundance of Wiener Wurst or an unwanted chunk of Gulaschfleisch because we were too afraid to contradict their, glaring and garbling as they poked a piece of Fleisch. It was a cultural milestone for everyone of us when we could confidently approach a meat counter without cowering. It’s not uncommon to get little, rolled up samples of ham or cuts of sausage which they spear with a pronged fork and jab at you over a spit and polished glass vitrine. And once you got used to the harsh dialect, you realized they were saying nice things while jabbing meat prongs at you, but nice Austrian dialect is like saying that the juicy loogey you just hucked up wasn’t terribly phlegmy. Unfortunately, one of my Australian friends had gained so much confidence at his local butcher that he decided to charm the meat ladies with his newly acquired language skills. He was always bragging about how he had been able to converse with them and how they even cracked a grim smile at his cute, beginner German. Until one day as he was walking home with a freshly purchased chunk of meat (I’m sure he had no idea what he had actually bought) and was wondering why the ladies began to glare at him again. He had only asked if he could smell the meat they were pronging at him and while craning his neck towards it for a whiff, they yanked it away. I asked him to repeat the sentence he had used in German and realised he had confused the German verbs rauchen and riechen and had insulted the meat ladies by asking if he could possibly smoke the rolled up slice of meat on the end of her prong. In the end, I was secretly happy that he wasn’t making any more progress than the rest of us cowards. I do like the Austrian dialect even though I still don’t understand everything. This story reflects what it felt like as a newcomer to the language. German is now my second language, it is the language of the man I fell in love with and married and the mother tongue of my two beautiful children. An English conversation course based on TED talks. Price 150.- Euro. 6 times.